What connection exists between the thunderbolt and the wheel? In the aftermath of Julius Caesar's conquest of Gaul (modern France), scores of local Celtic gods and goddesses were deliberately assimilated to members of the Greek and Roman pantheon. A particularly popular Celtic god was Taranis, literally "thunder", whose cult was incorporated in that of Jupiter. Jupiter was, of course, the Roman thunder god par excellence. But despite the extensive syncretism, the local gods managed to retain many of their original attributes. Taranis' stock attribute was a wheel. Sometimes the god is shown holding this wheel in one hand. The statue shown above, which misses the head, is of Provencal origin and is now on display in the archaeological museum at Avignon. In other cases, the god itself was represented by the wheel. The little bronze wheels shown above, excavated in Alesia, are thought to symbolize Taranis. Alesia was probably the most famous Gaulish stronghold attacked by Caesar, but the wheels have been found in many other places. The pivotal question is: why wheels? What connection exists between the thunderbolt and the wheel? The explanation panel provided in the attractive little museum at Alesia explains that the wheel "is a cosmic element. It designates, like the little wheels, the celestial universe." It seems fair enough that the wheels had a cosmic significance, but why of all gods would Taranis be associated with it? It is true that the revolution of the stars around the pole was often symbolised as a giant wheel in the heavens, but Taranis' wheel would seem to have deeper roots. 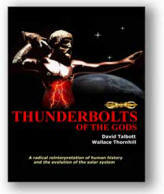 Various ancient societies associated the lightning with a wheel. Marija Gimbutas has shown that the Baltic thunder god, Perkunas, was thought to procure fire by rotating his lightning-club in the nave of the solar wheel. In India the thunderbolt was envisaged as a disc with a hole in the middle that rotated when launched and shot lightning in all directions. This disc was a form of the vajra, the sacred lightning weapon of Indra, and was later depicted in the hands of Vishnu as the cakra. Could it be that Taranis' wheel derived from a similar tradition? If so, where could the belief in such a lightning wheel itself have come from? There are many indications that the ancients located the lightning wheel at the pole of heaven. For example, the twirling disc of Vishnu symbolically denoted "the revolving of the universe on its axis", as the symbologist Cooper observed. And the Chinese held that the lightning flashes through the lie kou, a hole at the centre of a large disc. Whilst the disc itself denoted the sky, the hole at the centre was explicitly identified with the pole. Scores of other traditions, especially from the Americas and Siberia, allude to the 'hole at the pole', above which either the sun or the thunderbolt dwells. All of this goes to show that there is no tension between the lightning wheel and the representation of the dome of heaven as a wheel. Taranis' wheel corresponded at once to the turning wheel of heaven and the lightning wheel. But one question remains unanswered: just how could the idea of lightning at the pole have arisen? And how could the equally odd notion of the hole at the pole have come about, provided that the ancients were not talking of the hole in the ozone layer? The answer to such intriguing questions is the immediate fallout of the model promoted on this website. The prototype of the lightning that the myths are concerned with was the cosmic axis in its glowing aspect, a stupendous plasma discharge tube that formed during the late Palaeolithic in response to high-energy disturbances in the magnetic field of the earth and an increased solar wind. The surrounding plasma sheath, spinning around the axis and emitting fiery jets, appears to have been the prototype of the turning wheel, viewed from an axial perspective. The wheel of the thunder god is only one of literally hundreds of equally puzzling mythical motifs that the plasma model explains at once.